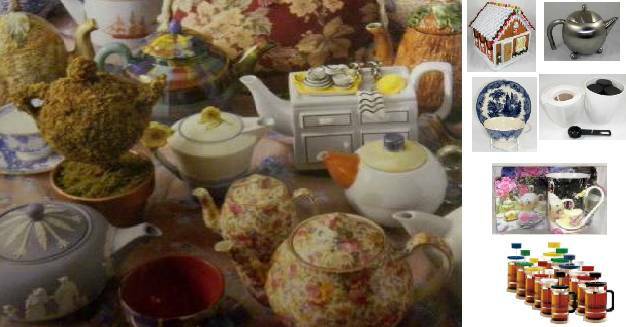 Since cast iron teapots come in a variety of styles and colors, they have become highly collectible. The wonderful thing about a cast iron teapot collection is that they can be used and enjoyed by the collector. When purchasing a cast iron teapot be sure to purchase one that is fully glazed on the inside. Some manufactures do not glaze the inside of the lid. If not fully glazed the teapot will rust and the tea will taste awful. 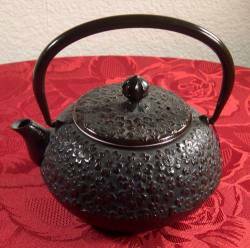 Cast iron 11 ounce black teapot with raised dots in a traditional design by Joyce Chen. Deep brown 19 ounce cast iron teapot with raised cherry blossoms by Joyce Chen. 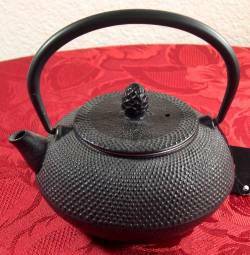 Dark blue 11 ounce cast iron teapot with raised waves decoration by Joyce Chen. 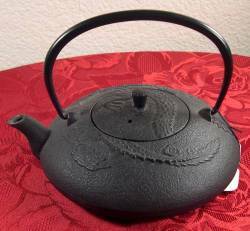 A cast iron 16 ounce teapot with a raised relief of a dragon by Joyce Chen. 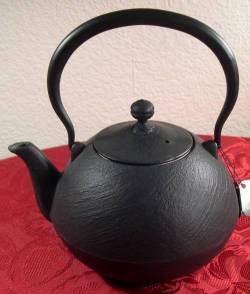 Beautiful large 36 ounce cast iron teapot with a delicate satin finish by Joyce Chen.